Speed, distance, and time display. The speed units can be toggled between mph and km/h by clicking the mph button. Three-way display showing current compass heading, calendar, and weather at the time of the drive. Latitude and longitude. For dashcams such as the BlackVue series, the altitude, GPS signal confidence (HDOP), and number of satellites in view is also displayed. See Your Tracks in the Map Window The Map Window animates to show the current position of the vehicle against a map background. The route line is color-coded based on the vehicle’s speed. You can click on the route to jump to that point in the movie sequence. You can toggle between street map and satellite imagery map backgrounds. Choose either Google or Mapquest maps to get the views you like. Drop markers anywhere along your route. The markers show up on the Map and in a List view. The time, date, speed, latitude, longitude, movie name, and movie time are also displayed. Double-clicking a geotag in the Geotags List will instantly jump to that point in the route. The geotags can be exported to a text file, and imported back in. All loaded movies are shown in the Movies List. Movies that are uninteresting can be toggled off so they no longer appear in the movie sequence and their data is no longer displayed in the Map or Graphs. Export Your GPS Tracks Dashcam Viewer allows you to export your GPS track data in a number of formats, including comma-separated value (CSV), GPX, and Google Earth KML (shown on the left). You can also export portions of your movies to separate files, or export a snapshot of the movie to a PNG image file. I’m testing the free version with an Akaso V1 dashcam and works perfectly almost everything. The only issue is that are not visible accelerometer data (they are visible, using Akaso player or some other dashcam players). Is it normal? Have I to activate something? Hi Ricardo– for the Akaso V1 I’ve decoded the time, latitude, longitude and speed but unfortunately I could not find the accelerometer data. It’s not a real problem, anyway, is there a hope to get accelerometer data in the future or did you abandone the “reasearch” on Akaso V1 encoding? Is it possible to view a video file with no gps data (due to resizing in my case) in combination with a matching gpx file? Yes. Just change the filename of the GPX file to match the name of the video file. Then load the video file and Dashcam Viewer will load the GPX automatically. How do you combine files? I have the trial version at the moment. Registrator Viewer had an easy way to combine from Blackvue 750S-1CH. Mapping doesn’t work. I’m really interested in the ability to group files, 750s records in short clips at 60fps, including the corresponding GPS data. Is that supported on your paid version? The trial version can combine up to two files using the Merge Movies toolbar button. I have the trial version of DCV, and have just tried it out with my Vantrue N2pro. I like the ability to “switch” between the two channels (front and rear camera), and have them play at the same time when I switch back and forth. The viewer the camera manufacurer uses doesn’t do this. What the issue with DCV is it constantly shows 7mph as my speed regardless of the actual speed, which is also tagged in the video frames by the camera, along with other GPS data. The program the camera uses accurately shows GPS info and speed. The dashcam creates only one folder…DCIM, with the video files in that folder. No other folders on the SD card are created, and appears GPS data is embedded within the video files. Will this camera eventually be supported by DCV? PS: I sent this same message along with the sd card contents. Gregg, good news for Vantrue owners– the Vantrue N2 and N2Pro will be supported in the next Dashcam Viewer version (2.7.9). Excellent! I also have noticed that I can view the dual channel videos in a PIP on the Mac version, but that same feature isn’t available on the Windows version. Will this possibly be implemented in the future as well for the Windows version? I primarily use Windows. Good news on that front too, Greg! I’ve got 2channel PiP working in my beta version of Windows Dashcam Viewer 3. Hopefully I’ll have the beta out in less than a month. I purchased both the mac and windows versions, that is definitely a good program, and I look forward to the newer features to support my Vantrue N2Pro. It is under a different email address, but it’s the same user…me. Any possibility of eventually adding other overlays into the exported video (mainly the map)? To get that now, I’m having to do use screen capture to capture the map window, then video editing software to combine the two. That’s a bit beyond Dashcam Viewer’s purpose and more in line with video post-processing software. I recommend RaceRender for doing those types of overlays. Hi,John I tried your software with my dashcam “Vifio G1WS”. But it’s can’t detect my track. Is my dashcam support by your software? I think you mean the Viofo G1WS. Yes, the samples I have from that dash cam work in Dashcam Viewer. Are you sure you have GPS data recording on and that the antenna has a view of the sky? You won’t see GPS tracks inside a garage for example. Antoine, this is an excellent application of Dashcam Viewer! 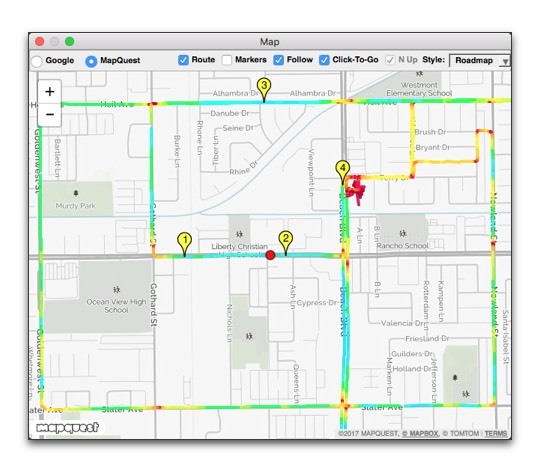 You will see your driver’s route, speed, stopping points, etc. Of course your should let him know beforehand that the dashcam is installed and recording. Thanks from Sydney …works well. The rendition of the .mov from Mobius look very good,better than my usual player. Use the Windows menu to select which window you want to see (Map, Dashboard, Graphs). If you don’t see any data in these windows then it could be that your dashcam is not a supported model. I have yet to download this software (still waiting on my dash cams to arrive). I will need to load video from two separate dash cams, same make and model, for this viewer. Can I select a different folder in which to copy the video and GPS files, perhaps giving each folder the name of the vehicle? Yes, you can rename the high-level folder after you copy it to your hard drive. So there is no problem supporting two dashcams. Hello John Dashboard Display goes only up to 140 KM/h how ca i change that here in europe we drive fast and in Germany we don’t have any speed limits 🙂 so hope that is possible to change to 250 or 300? The max speed on the speedo is 140 mph or 140 kph and this is fixed. However, the digital display in the Viewer window will display your actual speed. Hello: Does the current app read the gps log from the Phantom 4 ? I have not had the opportunity to test any GPS log files from a P4. If you send me a couple of files and their logs, I can take a look. See the FAQ question #1. Yes, Dashcam Viewer should work with your Phantom 4’s SRT files. Hi John – Excellent software! I would like to offer a possible enhancement however, could we have an option to export the photo into a jpeg with the GPS co-ordinates and the GPS time embedded into the metadata? This would greatly speed my workflow of phot extraction. Tom, would embedding the lat/lon in the filename work for you? Hi John, Sorry for the delay, having lat/long in the filename would help, but I am displaying still photos on a map which uses the metadata to obtain the coordinates. Perhaps someone knows how to script parsing the filename and inserting the metadata, that could work. Does the Windows 10 version of Dashcam Viewer support picture in picture yet> if not, when is it planned? It’s still high on my list of future enhancements but I am having technical difficulties with the implementation. No timeline on it yet, I’m afraid, but I haven’t forgotten about it. I have been trying to download this program and always is ” rejected ” by the computer with a message that says that my windows 10 is not compatible and that can not open / run the software that I should contact the software company. Any solution for this ? That’s strange. Sounds like the installer is being blocked by the OS. Can you loosen your security settings? If that still doesn’t work, go to my Blog and download an earlier version and see if it works. Hi, on the OSX version there seems to be a 500 file limit – my Blackvue, with a 64Gb card will easily produce more than 500 files. It would be great to be able to filter by date and time, parked and normal. Yes, there is a 500 file hard limit. I didn’t think anyone would need more than that, but I guess I was wrong! The Snapshot feature does not really work it just seems to capture the top third of the picture? I verified that this is indeed a bug on Retina-based Macs. Thanks for reporting it, Mick. I’ll take a look. 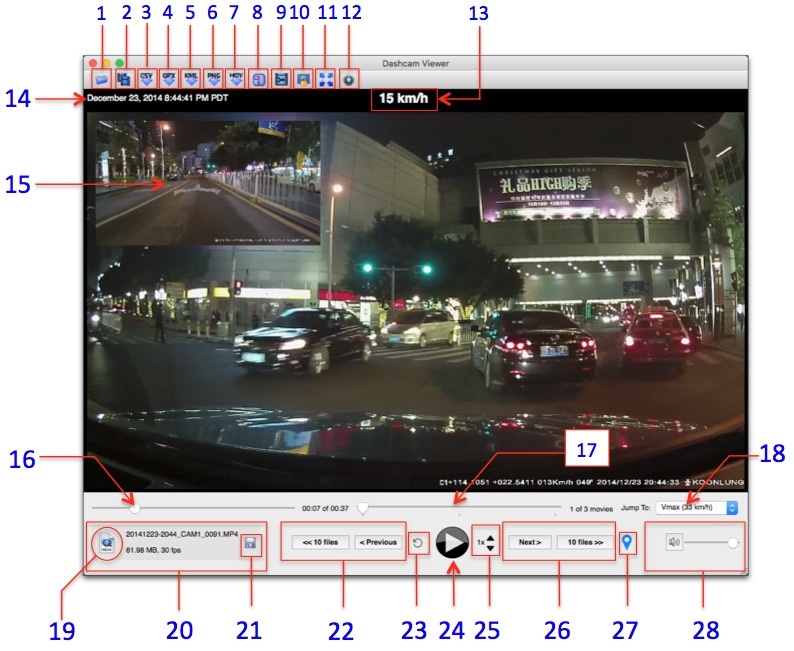 Is there an option to group overlapped videos if a dash cam records a sequence with, say, 1 second overlap? Thanks. Vladimir, I’m not sure what you mean to “group overlapped videos”. But since this is just a simple player I suspect the answer is ‘no’. Sorry it took a while to respond. I mean that when my dashcam (Street Guardian SG9665GC) starts a new file, the first second of it is a copy of the last second from a previous file. Therefore, if I wanted to merge the pieces into one file, it will not be smooth at the merging points. Is there any chance you can add an option to trim x seconds from the beginning of a file when merging? I can send you a link to the samples if needed. Thanks! Thanks for the answer. Can I export the time-stamped GPS data like in .gpx or .csv format? 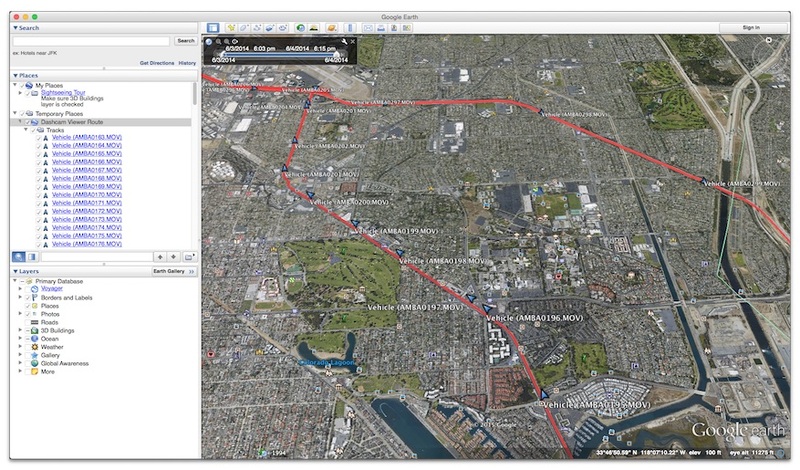 Yes, Dashcam Viewer will export your GPS data to both CSV and GPX format. Please see the Users Manual for details. I am thinking of buying Koonlung K1S (2-channel). I want to have synchronized GPS and speed data with video. 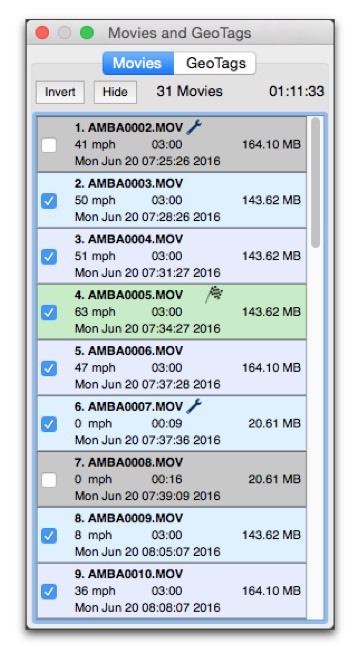 Is this application provides (or export) time-stamped GPS data and speed? I will be grateful for for advice. Thanks in advance for your kind suggestion. 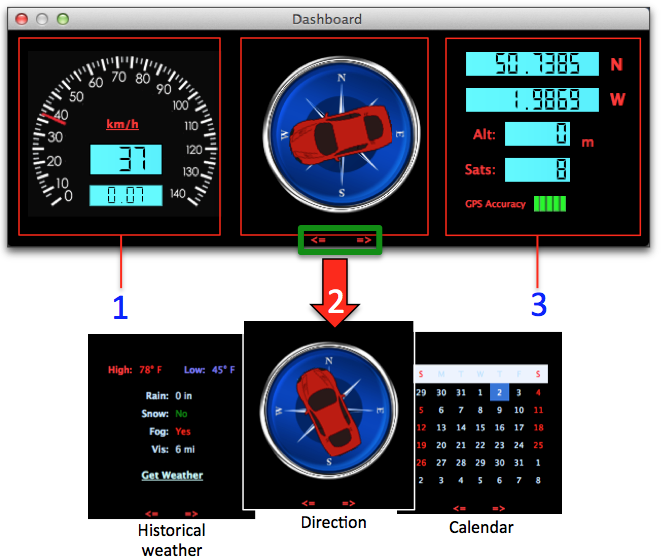 Ardhendu, the Mac version of Dashcam Viewer will display both channels of the K1S simultaneously (picture-in-picture). The Windows version does not have this capability yet. This works for video playback for the Thinkware F750, but unsure how to see GPS data, etc. Scott, the GPS data is embedded in the F750 movie file. Previously I have had trouble decoding the F750, but recently I think I’ve solved it. Stay tuned. Scott, thank you for the movie files. I was able to decipher the GPS data embedded in the file. The next version of Dashcam Viewer will display the GPS data (v1.8.7). Unfortunately, the MP4s produced by the Thinkware F750 don’t play in Mac Dashcam Viewer or Mac Quicktime Player (“unrecognized format” error). Apparently they do play on Windows. Go figure. I’m not familiar with that model, Alan. 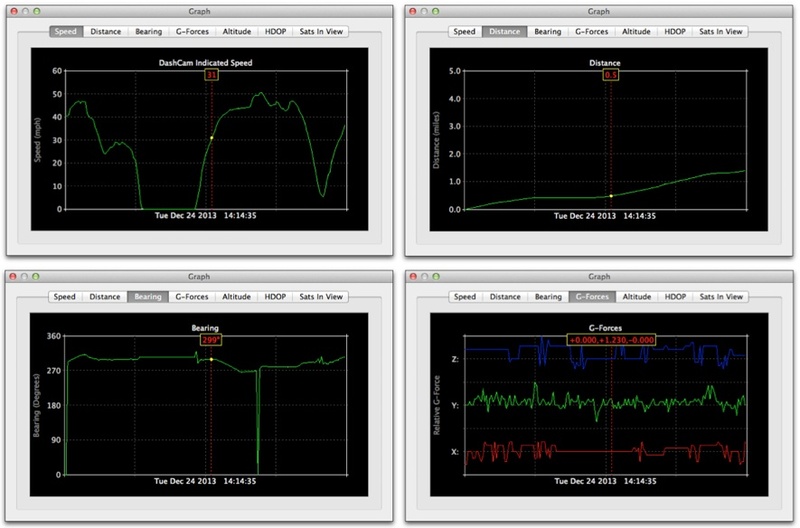 I’ve just tested movies from the models on my http://dashcamviewer.com home page. Please see the FAQ, question #2. Hi, will this work with the RAC02 UK dash cam? Dave, I’m not familiar with that model. Please see the FAQ, question #2. Hi John, I have tried the trialware, and it plays back the video footage (though a little slow at times – poss down to hardware/1080p capture); however, it does not support the GPS data for maps etc. as such, I have followed the procedure and sent you the files to look at. John, your a legend – have just submitted for full upgrade versions. Thanks for the quick work. Does this software work with the Moni 0806? I have not tested on Mini 0806 (it is very new!). But so far DCV works on Mini 0801, 0803, and 0805 (in 1080p modes). So it may just work on 0806. Give it a try and let me know!